All great journeys begin with a single step. BPY’s Beginning Sailing experience, is your first step into a new world with endless possibilities. You’ll join a group of eager adventurers who have also decided to explore the aquatic world from the deck of a sailboat. Your licensed and certified professional sailing instructor will provide all the resources you need in a safe and nurturing environment. 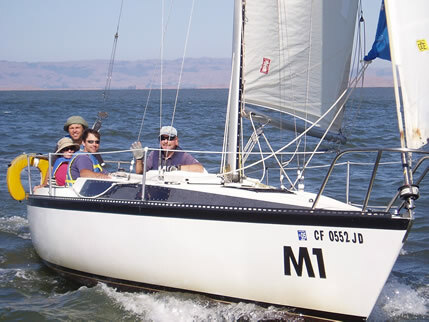 Your Beginning Sailing class breezes through basic sail terminology and concepts, the building blocks of solid, nautical knowledge and skills. You and your crew will apply what you’ve learned to sail the 25 foot boat with minimal guidance. Don’t worry, your instructor will keep you out of trouble and help when it’s necessary. Before you know it, you and your fellow novices will take control of the sailboat and sail it efficiently and safely from one location to another. Your knowledge and skills will develop quicker than you might expect. By the end of the two day, 14 hour sailing course you’ll shed the novice label. If you make the grade (and most our sailing students do), your instructor will award you the ASA 101 Basic Keelboat Sailing certification. This highly esteemed achievement will show the world you have earned the right to call yourself a sailor. Develop confidence in our 100% hands-on training program.